This walk: 2012-2-1. Sourton Tors, East Tor, Church of St. Thomas a Becket, Lake viaduct, Great Nodden, boundary stone, triangulation pillar, Sourton ice works, Iron Gates, King Way, icicles. Early view to Sourton Tors, SX 543 898, elevation 440 metres (1443 feet) ..... also known as East Tor locally because it is east of the village (Sourton). Closer view, with ice. This is not a granite tor but a dolerite formation (often found in dykes and sills)): it is a darker and finer grained igneous (from hot, molten) rock formed at the rim of the granite in this area. Intrepid band crossing ice, heading south - it felt like we had already reached Antarctica. A different view of the tor. Zoomed view to Church of St. Thomas a Becket, Sourton - with tree neatly in the way - can't see a thing with LCD screens on digital cameras in bright sunlight - where's my viewfinder?! Lake viaduct, max. zoomed photo possibly suffering from camera shake i.e. shivering. Zoomed view to Great Nodden aka Plum Pudding Hill, SX 539 874. Sourton, "So" it looks like "9o". This marked as BS on the map and is at the head of Deep Valley aka Withecombe Bottom. The stone is also known as Spring Rock. Scaled by our intrepid tor-bagger! The temperature today? I remember seeing -2°C on the car's external temperature indicator and the weather forecast gave winds averaging about 10 miles per hour. Calculating the wind chill for these conditions gives a feel of 13.9°F or -10°C. That's chilly! Five long ponds, 3-feet deep, were dug and lined with brick. The ice was described as a "crop" of which there were a few good years but the venture was wound-up in 1886 after a few warm winters. There was also competition from machines and the Plymouth Ice Company. Another view of the ponds. Our group gathered in the storage building that was once insulated with wood, soil and turf. Two granite posts, The Iron Gates, marking the King Way ancient track. These are described by William Crossing (1912, reprinted 2001) Crossing's Guide to Dartmoor, Peninsula Press, Newton Abbot, page 59 (5th line from bottom) and page 184 (2nd para). This was a fast, moorland track used by the King's messengers, avoiding the rutted roads. Used widely in the 1700's. In 1630, there was a petition to Charles I to provide horses on the western stages of His Majesty's Post, the normal roads were muddy, twisty, enclosed and slow. 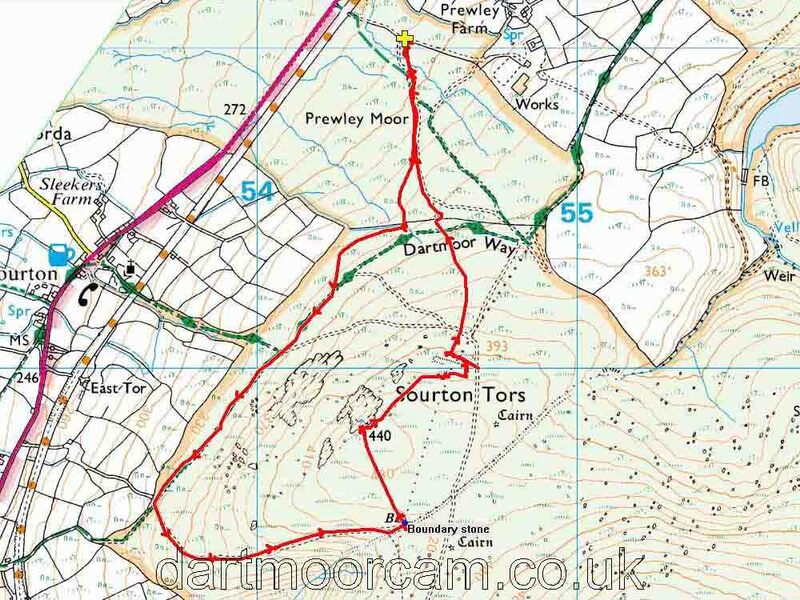 This walk was reached via the main A386 Tavistock-Okehampton road, turning off at the brown "Granite Way" sign shortly after leaving Sourton while travelling towards Okehampton, before reaching any other turn-off or the main A30 dual carriageway. Parking is at the yellow cross symbol on the map.